Why is the universe full of matter? More than 1,000 scientists from 30 countries are gearing up for an ambitious multi-year experiment to see if a close look at the smallest subatomic particle known to exist — the neutrino — can help answer some of science’s biggest unresolved questions. The Deep Underground Neutrino Experiment (DUNE) will involve shooting beams of neutrinos from a particle accelerator in suburban Chicago through the Earth to a neutrino detector set up in an abandoned mine 800 miles away in South Dakota. Though DUNE won’t get going for several years, its scientists are already working on necessary modifications to the accelerator, and building smaller, prototype versions of the vast detector — and feeling amped about what they might learn from the experiment. The main question that scientists hope DUNE will help answer is this: Why is there matter in the universe? What sounds like a silly question is actually one that has bedevilled physicists since the late 1920s, when the Belgian physicist Georges Lemaitre came up with the idea that the universe began with a colossal outpouring of energy — the Big Bang. Physicists have long believed that the Big Bang produced equal amounts of matter and an identical but oppositely charged substance known as antimatter. But if this belief is correct, why is antimatter all but non-existent in the universe while matter is everywhere, making up everything from stars and planets to the atoms in our bodies? DUNE scientists believe they can take a major step toward answering this fundamental question by proving for the first time that neutrinos and their antimatter counterparts, antineutrinos, behave differently. A single neutrino isn’t much — just a mote of matter having less than one-billionth of the mass of a hydrogen atom. But neutrinos are produced in vast quantities by the nuclear reactions taking place continuously in the sun and other stars, and they’re thought to be crucial to understanding the universe’s earliest moments. Physicists believe that in the first millionth of a second following the Big Bang, the world was made up of a swirling mass of neutrinos and antineutrinos, which then “decayed” to form particles of matter and antimatter. Neutrinos are thought to have decayed at a faster rate than antineutrinos, producing an excess of matter that led ultimately to the universe we see today. Instead, DUNE scientists believe they can gather enough evidence to infer that the differing decay rates really do explain the preponderance of matter. 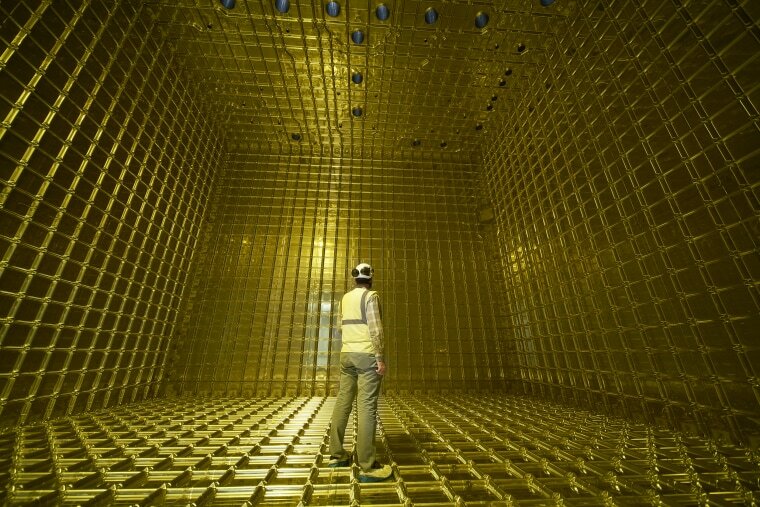 The key will be to study a quirk of neutrino behavior. Neutrinos come in three types — muon neutrinos, tau neutrinos and electron neutrinos. As these particles move through space, they repeatedly change from one type to the other. Scientists think they do this more rapidly than antineutrinos, and that these rapid changes explain the differing decay rates of neutrinos and antineutrinos. But neutrinos are notoriously difficult to study, in part because they change only over distances of hundreds of miles — which is why DUNE will send beams of neutrinos and antineutrinos all the way from Illinois to South Dakota. Although neutrinos are everywhere — a trillion or so zoom through our bodies every second — they almost never interact with the things they encounter. This means DUNE must generate vast numbers of neutrinos and antineutrinos and focus them into beams that are of such high intensity that the super-sensitive detector in South Dakota might be able to see them. The detector, located in the Sanford Underground Research Facility in Lead, South Dakota, is the world’s largest. It consists of a 70,000-ton vat of liquid argon, an extremely dense substance. Because its atoms are so tightly packed, the beamed neutrinos are more likely to collide with one of the atoms rather than simply passing between them. With each collision that registers, DUNE scientists should be able to determine whether the neutrinos and antineutrinos have changed type — for example, from a muon neutrino to an electron neutrino. Each beam should take about four milliseconds to travel from Illinois to Chicago, and DUNE’s accelerator will send the beams once every second over the course of many years. If neutrinos change more rapidly than antineutrinos, as expected, we can be more confident that neutrino decay helps explain the presence of matter in the universe. What will the world look like in 10,000 years?